In every sense, the word 'thriller' has never been more accurate to describe a film. After an extremely stale box office last week, with no films entering the market to overthrow Straight Out of Compton from the number one spot, now comes box office hopeful, No Escape. With it's real-to-life thrills and action that will have audiences holding tightly to their seats as they are taken on a wild and intense ride through Asia, the film hopes to jump start tickets sales back to life. 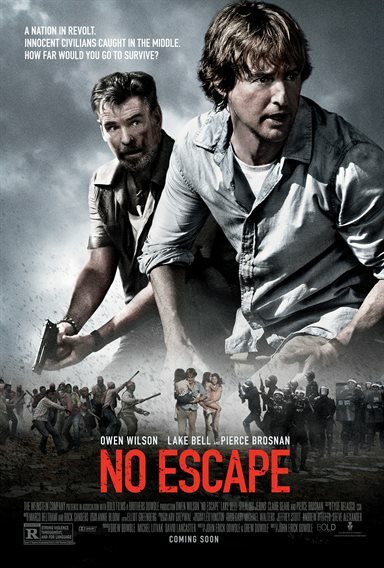 No Escape, Starring Owen Wilson (Wedding Crashers, Armageddon), Lake Bell (Children's Hospital, No Strings Attached), and Pierce Brosnan (November Man, Goldeneye), was originally entitled The Coup, and follows the perilous journey of the Dwyer family trapped in an unnamed Southeastern Asian country during a rebel uprising. After losing everything he had in Texas, Jack Dwyer (Wilson) moves his entire family to Asia to help a corporation fix a water problem in the region and give his family the fresh start that they need. Unfortunately for him and his family, they arrive one day after a coup on the government by the rebels who blame western influence for the troubles in their country. These rebels will stop at nothing until all Westerners are found and killed. It is this scenario that Jack and his family find themselves trapped in, with no safe place to hide and trying to get out of the country alive. No Escape comes from the mind of director/screenwriter John Erick Dowdle, known for such horror films as Devil and As Above, So Below. Co-written with his brother Drew Dowdle (Quarantine), they provide a unique directorial take on the film that puts you directly into the situation the Dwyer family finds itself in, and give you every brutal moment on screen. They don't shy away from the brutality that often happens in these situations, which gives the film an air of authenticity. Shot entirely in Thailand, Dowdle makes good use of the natural scenery provided in the region, displaying every intricate detail of the land through the view of a camera lens. In a film that relies entirely on playing to the audience's emotions as they journey with the characters, casting the right actors is crucial to the success of the film. Dowdle took some risks in his casting of Owen Wilson as his "everyday man" in this film, but it works perfectly. Gone is the wise cracking man from Wedding Crashers and Shanghai Noon, and instead, we get a person that acts like most of us feel we would if we were somehow put in this type of situation. He displays a new level of maturity and seriousness not often seen in his roles. Lake Bell delivers as good if not better performs as Jack's wife, Annie. Just like Wilson, she portrays the character perfectly. As someone trying to survive and not give into fear, she must struggle to save her family from this horrible ordeal. Rounding out the family are the Dwyers' two children played by Claire Geare and Sterling Jerins. The terror of this film truly hits home through their eyes, as you can see how they are trying to comprehend and deal with all that is transpiring around them. They are forced to witness things you hope little kids would never be exposed to, and their portrayals help to tug at your emotions even more than the adults. Helping out the Dwyer family here and there along their perilous journey is 007 himself, Pierce Brosnan. As usual, Brosnan pulls off his role easily. Embedding the character of Hammond with grit, he looks to find redemption and save this family from perishing in this horrific nightmare. No Escape is a heart-pounding thriller that never lets you catch your breath until the credits start rolling. In every sense, the word "thriller" has never been more accurate to describe a film. In fact, I personally found myself shaking once the film was over. It is almost as if No Escape needs a sign such as one you would see at a Universal or Disney theme park — "For your safety, you should be in good health and free from high blood pressure, heart, or other conditions that could be aggravated by this film. Subject matter may be too intense for some adults (and certainly don't bring your kids!)" Download No Escape from the iTunes Store in Digial HD. For more information about No Escape visit the FlickDirect Movie Database.